This PDF 1.3 document has been generated by Word / Mac OS X 10.9.5 Quartz PDFContext, and has been sent on pdf-archive.com on 05/02/2016 at 20:30, from IP address 153.91.x.x. The current document download page has been viewed 5049 times. File size: 96 KB (3 pages). suicide prevention: School psychologists’ acceptability of school-based programs. 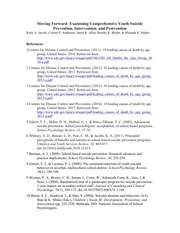 School Psychology Review, 32, 57-76.
perceptions of benefits and barriers to school-based suicide prevention programs. Children and Youth Services Review, 33, 869-877.
practice implications. School Psychology Review, 38, 233-238. 10 Brock, S. E., Sandoval, J., &amp; Hart, S. (2006). Suicidal ideation and behaviors. In G.
13 Hickie, I. B., Luscombe, G. M., Davenport, T. A., Burns, J. M., &amp; Highet, N. J.
attitudes and treatment preferences. Early Intervention in Psychiatry, 1, 333-339. 17 O’Keefe, V. M., Wingate, L. R., Cole, A. B., Hollingsworth, D. W., &amp; Tucker, R. P.
microaggressions lead to suicide ideation by way of depression symptoms. 18 Scott, E. M., Hermens, D. F., Naismith, S. L., White, D., Whitwell, B., Guastella, A. 20 American Association of Suicidology. (2011). Know the warning signs of suicide. Association, National Association of School Psychologists, &amp; The Trevor Project. This file has been shared by a user of PDF Archive. Document ID: 00338035.